Just when you thought they were out of ideas – easyJet came up with another winner, the easyJet album! Together with the Children’s Sleep Charity, the airline released a 10-hour album of continuous engine droning designed to drown out sounds, gently settle the brain and aid the on-set of sleep… genius! King of the PR stunt Greggs, hit the ground running with yet another winning PR campaign with their first drivethru. The bakery chain caved to popular demand on Twitter and opened the first of it’s kind in Manchester, meaning local residents (or just massive Greggs fans) can pick up an iced bun without leaving the car. As the singletons holy grail, Tinder has never failed to get it’s fair share of attention. However, last month, they took whirlwind romances to a new level when they united a couple who had been speaking for three years but never met – in Hawaii. The couple, who had sent approximately two messages to each other per year, had frustrated the dating app so much that they said they would unite them anywhere in the world that they wanted – we’ve personally always wanted to go to the Maldives…. 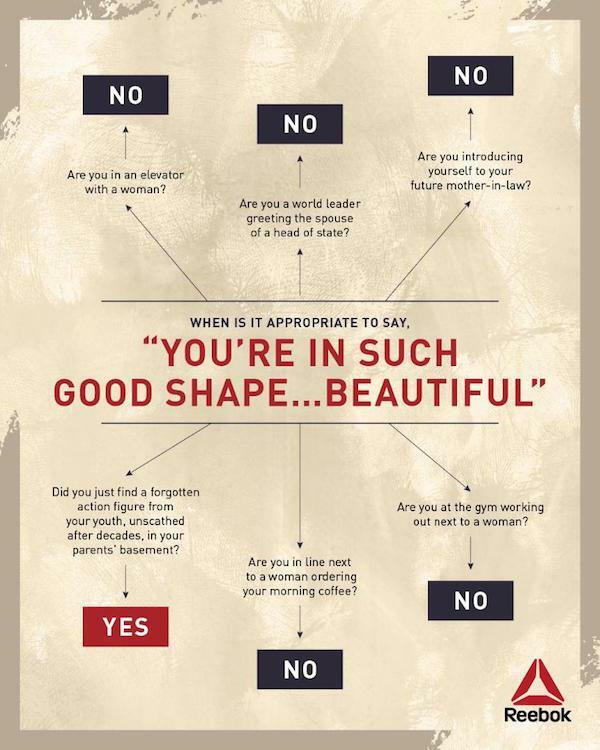 In hilarious response to Donald Trump’s somewhat strange comments to France’s first lady (she’s in really ‘good shape’ don’t you know), Reebok released a chart outlining scenarios when the comments would be appropriate. And when is it appropriate I hear you ask? Well according to the sports apparel company, ONLY if you have found a forgotten action figure from your youth, unscathed after decades in your parents basement. Well played Reebok!